All bookings with deposits made in in the calendar year prior to departure will attract a ground tour discount of 5%. 2019 - 3rd March, 14th April, 8th September, 13th October, 24th November. Apply for 2020 dates if required. Both tours run concurrently, starting in Baghdad , travelling north to Samarra, exploring as we can. Niniveh, Assur, Khorsabad, Nimrud and Mar Benham will be on our list once security measures are in place over the next few months for this addition. Returning to Baghdad and travelling south our highlights include Babylon and the Shrine cities of Najaf and Kerbala. At this point, the shorter 10 day tour returns to Baghdad before departing Iraq. The 15 day tour travels on further south to include Uruk, Eridu and Ur. Then to the little visited sites of Larsa, Lagash and Telloh. We stop in Nasiriya and spend sometime in the Marshes of Iraq, which enables us to visit Charax Spasinou, Alexander the Great's newly excavated port city, before reaching Basra and then finally returning to Baghdad. With all tours we try to keep costs down but also see as much as is possible within our given tour structures. Security considerations govern some of our time and restrict our absolute freedom but we seek to give you the maximum experience possible. Ancient and religious history abounds in this land between the two rivers. Excitingly, after long years of enforced abstinence the worlds major museums and universities are once again digging in Mesopotamia Iraq and Kurdistan. Day 1 Arrive Baghdad, Baghdad excursion, overnight Baghdad. Day 2 Morning tour of Baghdad, including Iraq National Museum. Afternoon visit to Agargouf, overnight Baghdad. Day 3 Samarra and Tikrit, (via Kirkuk), overnight Kirkuk or Mosul. Day 4 Mosul and Nineveh. (Khorsabad and Mar Matte), overnight Mosul. Day 5 Nimrud, Mar Benham (Assur, Hatra), overnight Baghdad. Day 6 Baghdad, Arch of Ctesiphon, possibly Seleucia on the Tigris. Overnight Baghdad. Day 7 Baghdad or depart Iraq. Day 8 Depart Iraq/or planned additional days. This is a special departure put on as an additional one to our normal Iraq tour schedules. 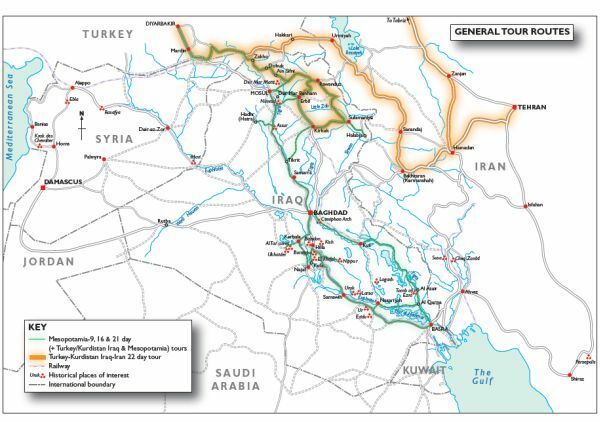 ISIS depredations in the north of Mesopotamia over the last 4 years resulted in us having to omit anything north of Samarra (apart from Kurdistan) due to the Security measures required to defeat ISIS. This has now been achieved but the mopping up is still taking place, certainly on the political front. Our application for security clearance has been made and we should obtain this in the near future. Our tour date will be June 16. The focal points are the Assyrian ancient sites andsome time spent around Mosul. This section being flexible for accommodation reasons. Security will be tight and great care will be needed by all concerned including camera sensitivity which will be insisted on, Personal politics re refugees etc, not encouraged as conversations. It will be hot weather, accommodation apart from Baghdad will not be good. Day 1 Arrival Baghdad. Hotel transfer. Late afternoon excursion to Kings Royal tombs. followed by Khadamain Mosque and Shrine. Overnight Baghdad. Day 2 Baghdad City Tour and environs: National Museum, Copper Souk,Mirjan, Mosque, Mustansiriya School, Afternoon visit to Agargouf Kassite Ziggurat. Day 3 Early start with drive to Samarra for Minaret and Abbasid Palace . Then on to Tikrit, once home to Saddam and to Kirkuk/ Mosul overnight. Day 4 Another full day . Travel to outskirts of Mosul, look at the site of Nineveh, Nebis Yunis. If time. then Khorsabad Overnight in Area. Day 5 Turning back south we visit the Monastery of Mar Benham, then ancient Nimrud before overnight in Baghdad. Day 6 A full day in Baghdad and a visit to the Arch of Ctesiphon. Overnight in Baghdad. Day 7 We travel to the ancient cities of Mesopotamia, Kish , once home to Sargon, Babylon and then Borsippa . Overnight in Kerbala, the Shrine city. Day 8 From Kerbala- we visit Ukhaider, the Islamic castle/ palace, the deserted Christian monastery excavation. Then on to Khifal, 6th cent B.C. Tomb of Ezekial, then through to Kufa and finally to Najaf where Imam Ali is buried. Overnight Najaf. Day 9 We drive to ancient Nippur famous for its 4,000 B.C. Temple of Enlil then to Warka (Ancient Uruk) one of the most important sites in Iraq. Now being excavated again. Overnight in Samawih. Day 10 Depart for Baghdad. Overnight in the City unless you decide to take the option for the evening flight home. Day 11 Transfer to airport a.m and depart Iraq. Basic costs from £2,750 plus flights and visa. Day 1 Arrive Baghdad, afternoon excursion. Overnight Baghdad. Day 2 Baghdad. City tour and environs. National Museum, copper souk and adjacent Mustansiriya School, Mirjan Mosque Afternoon visit to Agargouf Kassite Ziggurat. Overnight Baghdad. Day 3 Early morning start with drive to Samarra for the Minaret and Abbasid Palace. 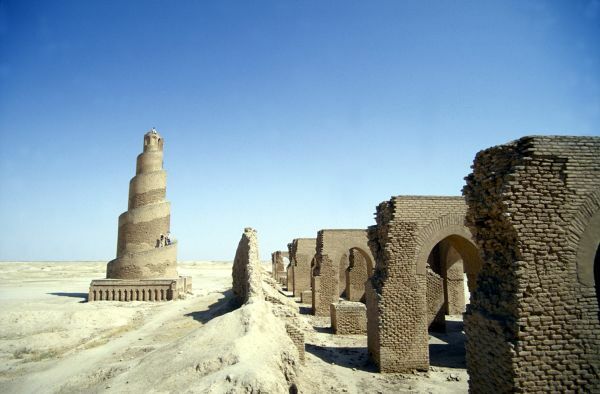 Travel on to Tikrit, once home to Saddam and his tribe, view his palace and the early Christian Church site. Continuing on to contentious Kirkuk and Mosul environs. Day 4 A full day exploring the environs of Mosul, looking at the sites of Nineveh and Nebis Yunis and maybe Assyrian Khorsabad and Matti Monastery. Day 5 We travel back south visiting the Monastery of Mar Benham and ancient Nimrud. If possible we will visit albeit briefly ancient Assur and then Hatra, that oasis Arab city of Roman fame. Return to overnight Baghdad. NOTE. Those last 3 days are ambitious and subject to change as we develop the programme again but it is part of the ancient history and indeed modern history of Mesopotamian Iraq. We shall need great care and understanding of the local peoples needs. We tread carefully. Day 6 A full day in Baghdad and also visiting the Great arch of Ctesiphon. Overnight Baghdad. Day 7 Ancient cities of Mesopotamia – Kish then Babylon, Borsippa and finally the Shia Shrine of Kerbala where we overnight. Day 8 Our excursion to Islamic castle /palace of Ukaider follows, then close by the deserted ruin of a Christian monastery. We travel on to Khifal. 6th cent B.C tomb and shrine of Ezekial, then to Kufa and finally to Najaf where Imam Ali is buried where we overnight. A full and diverse day. Day 9 Now to the ancient and religious site of Nippur (4,000 B.C) famous for its Enlil Temple. Next we travel to that most important and huge site of ancient Uruk. Here writing was developed, the pottery wheel, strip agriculture all further developed. Overnight in Samawih. Day 10 (note. our shorter tour clients leave us for Baghdad.) This morning we travel further south stopping to explore the desert exposed 2,900 B.C site of Larsa before visiting Tel Ubaid famous for its definitive pottery sequence, then Eridu that most early first of the cities that we know, dating from 6,000 B.C. Finally to Ur, home to Abraham and its magnificent Ziggurat and Royal tombs. Overnight in Nasiriya. Day 11 Using Nasiriya as our base we visit Lagash and Telloh. These site have been little visited for many years but are now being seriously excavated and are promising great discoveries. Overnight Nasiriya. 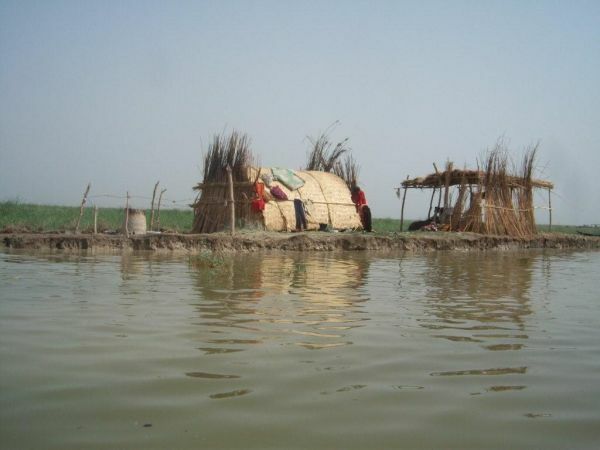 Day 12 We now explore a little of the Iraq Marshes before travelling to Basra via Querna where the Tigris and Euphrates meet and become the Shatt Al Arab. A newly being excavated site Charax Spasinou, Alexander the Greats' port city is next before we overnight in Basra. Day 13 Excursions around Basra city, including The Saddam Palace complex and the new Museum. Our Shatt Al Arab river excursion completes the day. Overnight in Basra. Day 14 Return to Baghdad by road visiting the tomb of Ezra en route. For those short on time we can drive straight to the airport for their transfer out or overnight in Baghdad. Day 15 Early morning departure to the airport for the flights out. The above schedule will be followed in outline but be aware for this year there may well be changes as the sites in the north continue to be assessed and repaired after the Daesh deprivations of the last few years. However there is renewed appetite for new excavations and we shall see many new discoveries. We will have to continue with security cover for the time being and we are travelling with the Co operation and good wishes of the Ministry of Tourism and Culture. Included - airport transfers arrival and departure, visa assistance at airport, hotel twin room accommodation, breakfast and evening meal, site entrance fees, All road transport/driver, interpreter/guide plus Hinterland Travel tour leader. Full security provide by Govt. Ministry with security personnel with the group. Not Included – Insurance, International/Internal flights, visa cost, single room supplements. Each tour is led by a Hinterland Travel tour guide in addition to the English speaking Iraq interpreter/guide. All land transport is by local air conditioned vehicle with an Iraqi driver. Hotel accommodation is provided throughout and this varies in standard,some very good some not so good, all on a twin room sharing basis. When single rooms are available then a single room supplement is levied at all the hotels that we use. Two meals a day only, breakfast and dinner, are included. All passports need to be acceptable to the Iraqi authorities. To make a booking with us a good clear copy of the information page of your passport is required along with the completed booking form and the deposit of £350. The final tour balance to be paid 8 weeks prior to the tour departure date. We have an open age policy as long as you are fit and healthy but clients over the age of 75 should enclose a letter from their doctor confirming that they are fit to travel with us. The Iraq Tourist visa is obtained through Hinterland Travel by prior arrangement with the Iraqi authorities. Four weeks should be allowed to obtain these and your passport will be stamped on the tour arrival day/date (not before) only at Baghdad airport. Visa authority letters are sent to you for flight boarding purposes before you depart from your home. On your arrival at Baghdad airport you are met by a Ministry rep to facilitate your visa procedure. A cash payment in US Dollars has to be paid to the Immigration desk at the airport. It is important that we are informed of your flight arrangements as your visa begins only on the tour start date. For visa and transfer arrangements we require you to arrive in the morning of the tour start date. Please check with us before booking your flights. The group size will be a maximum of 20 persons however the average group size rarely exceeds 12 persons of all ages and nationalities. English is the common language spoken along with the Arabic of the staff. Security arrangements and procedures are paramount in the Iraq of today. To be able to travel through the innumerable check points and visit the sites ancient and religious travel papers and security are required and these arrangements have to be adhered to by all clients. We provide both, travel papers and the necessary security. Please read through our booking conditions on this website and any published in any of our literature before booking a tour to Iraq with us.